Keep a special month close to your heart with the simple yet elegant Fremada cubic zirconia birthstone heart necklace. A bold heart-cut cubic zirconia in your choice of color is prong set in the center of the heart-shaped pendant, highlighted with a row of gleaming white stones. Crafted with white rhodium-plated sterling silver, the 18-inch cable chain necklace features a polished finish and secures easily with a spring ring closure. All weights and measurements are approximate and may vary slightly from the listed information. Treatment code CR (cubic zirconia). See Treatment Guide for further information. Please note: Some options listed or pictured may be currently out of stock. Please see option drop down for all in-stock options. 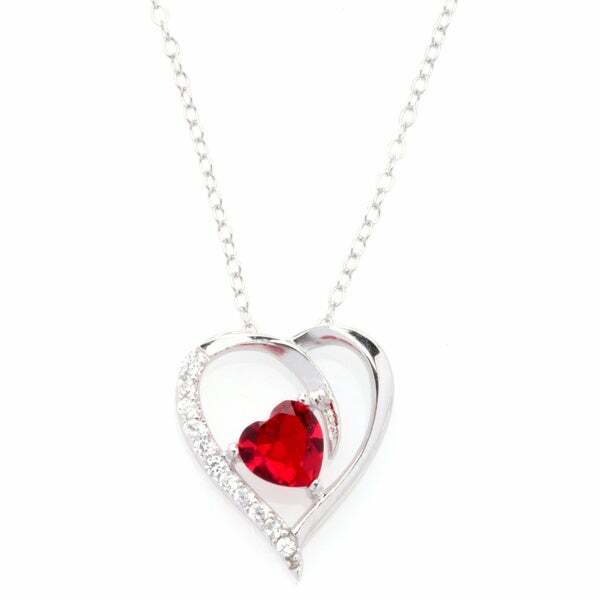 This necklace with cubic zirconia heart with my birthstone is very pretty. I have a diamond cubic zirconia for my birth month. I will be wearing this necklace with sweaters this Christmas! Bought these for my neice's with their baby's birthstones in them. The necklace is beautiful.It 's a good gift. Great purple CZ! Super pretty design! This heart pendant is a great buy. The CZ heart is very vibrant, like a good quality, deep color amethyst stone. The outer heart is nicely made and it stays put well, not flipping over like some pendants do. I'm glad that I bought it, especially since it's rhodium plated and I won't need to worry about tarnishing. If you're looking for a pendant that has a vibrant and rich purple color, then this one is a good choice. Great price too. The item was much smaller than I expected. I thought it would be the size of a quarter, but its more like the size of a penny. Overall the item is nice, I don't think that it will make a good gift for an adult size person. Wow! Love this necklace. So happy I bought two (needed two different birthstones). The pendant heart is the perfect size. The styling is beautiful. The birthstones are an absolutely amazing color and the clear side stones are in proportion, the perfect finishing touch. This is Really Lovely in every way. Buying one for myself! I purchased the necklace for my granddaughter for Christmas, age 10 , she loves having a necklace with her birthstone which is emerald, the heart shaped stone color is really pretty and shiny. I saw almost identical necklaces advertised in several holiday circulars. Imagine my surprise when I found this one @ Overstock for less than 1/2 the priced. Purchased as a gift for my 86 yr old mother-in-law, I was pleased with it's simplicity, color & sparkle. She loved it, but has trouble fastening the chain which is very delicate. I'm ordering her an extender chain with larger clasps to solve that problem. My 3 granddaughters will be getting one of these birthstone beauties for their birthdays. buying online can be tricky because you can't see or feel the item, you have to trust the information you are given. this necklace is truly beautiful and good quality........a grant buy!!!!! Purchased for my niece as a birthday gift. She really liked it. Its nice for a child but not sure if I would purchase for an adult. The quality is nice but not sure if it would hold up its shine if worn daily. Nice piece. Quick delivery. Very happy. It's pretty, but doesn't look as rich as I thought it would. A very beautiful pendant. My wife absolutely loves this necklace. The stones are beautiful, people compliment her on this piece all the time. I recommend this necklace if you love your woman! Loved the fact that my sister adored it and yes I would recommend to friend. "What size is the stone?" "Just yesterday I had 4 of these necklaces in my cart of the ones I want to purchase. Now for some odd reason I'm missing one for February and now when I select an option of a month, February isn't coming up as a option either. Can you tell me if I can still get the February one, if so how? I need to put in the order ASAP for Christmas! Thank You!" "Cart will allow purchase of one at doorbuster price. I need two, may I purchase one at a different price. Two granddaughters lost their mother and wanted heart with mother's Sept birthstone." "In the pictures, the January stone looks like a ruby, but it's supposed to be a Garnet. Is this just the picture? I ordered one as a Christmas gift but I really want it to look like a Garnet." Based on your monitor or screen the colors may not be represented accurately. "Is it available in December? I don't see that month"
Hmmm. Strange. December is not under the Option section, however, it can be viewed on the left-hand side of the screen when you go through the actual pictures of all the months. Hope they fix this "flaw" on the order form for you, because the necklace is absolutely dazzling !!! Good luck ! Unfortunately, December is currently out of stock. We hope to restock this month if it becomes available. "what is the size of the silver heart in inches"
Hello patti, this item is approximately 0.59 inches wide x 0.70 inches long. Thank you for shopping with us. "I bought this necklace two days ago, but once I purchased it I realized it was the wrong birthstone so I canceled the purchase and tried to buy the right birthstone. I used a prepaid visa card; however, my card has not been refunded the $*** yet, and it has been over two days. How long should it take for the money to be refunded to my card? Thankyou"
Hello J_Hamlet98, you will be contacted by Customer Care. Have a great day.